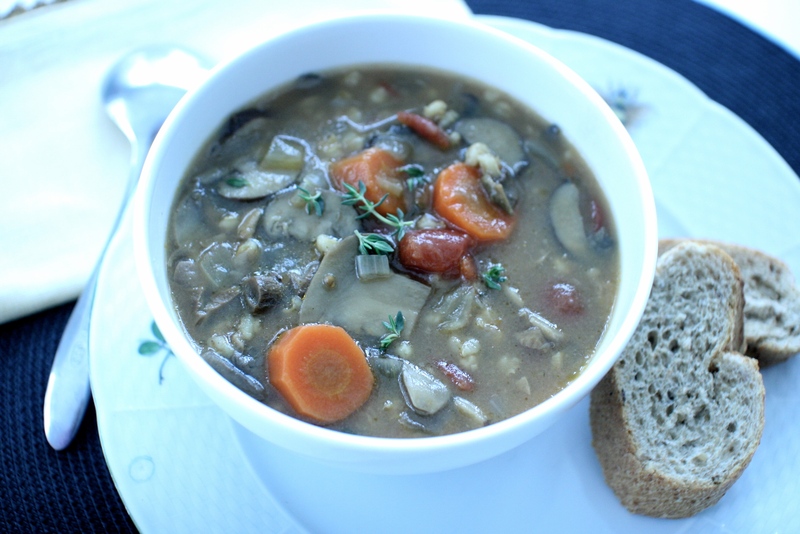 I’ve always made beef barley soup, but this week I wanted to make a no meat version with lots of mushrooms. 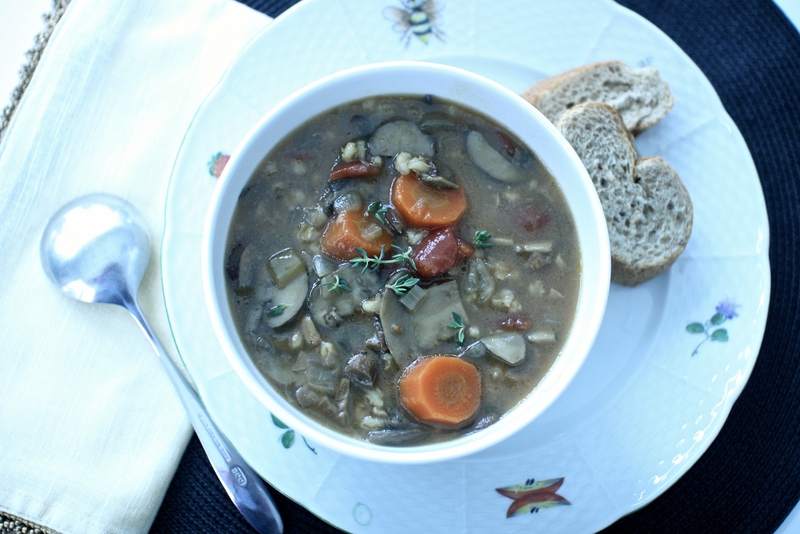 I love the combination of barley and mushrooms. When making beef barley soup, the first step is always browning the meat. Step two is, of course, deglazing all that brown good stuff off the bottom of the pot. I was concerned that absent the whole meat searing process, this soup wouldn’t hit the mark… so glad I was wrong. I’m sure it’s because I used dried porcini mushrooms. The dark, woodsy liquid that’s left behind when you reconstitute the mushrooms is heavenly. In fact, I read that the flavor imparted by porcini mushrooms is considered umami. Who knew? I’m certain it was the key to the richness of this delicious soup. 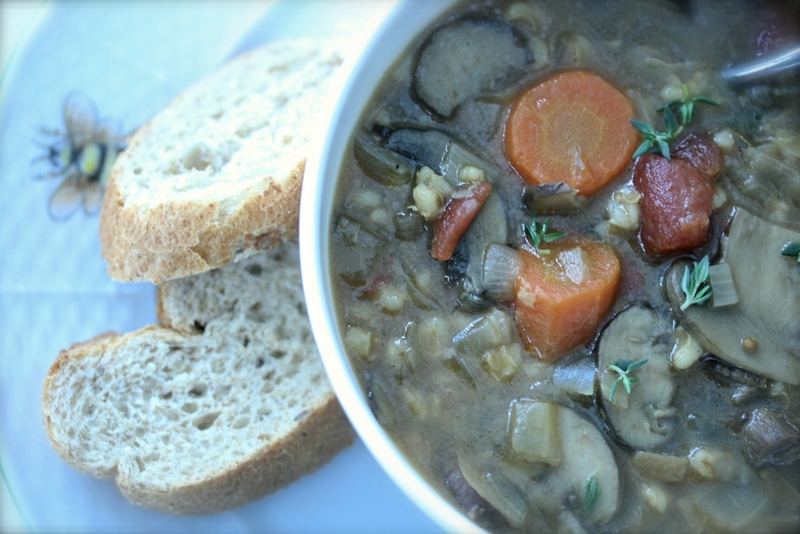 I used my beef barley recipe as the basis for making this, but did a little poking around online to see what others had to say. They all pretty much use the same basic ingredients, though some add a little vinegar or wine, and others soy sauce. I opted for soy sauce and it was the perfect addition to round out the flavor. theKitchn has a great tutorial on how to prepare dried porcinis. I’ve included details below, but you should have a look at their site too. They did a nice job with the step by step, including pictures. I just realized that I made it all the way to this point and managed not to mention the weather. A few days at 50 degrees has made it much more tolerable. However, according to Alan the Polar Vortex is back! I guess the down jackets aren’t getting put away anytime soon. Spring where are you? Sigh. Nothing else to do but eat soup. * I used chicken stock to make this because it’s what I had on hand. Vegetable stock would be perfect too and would make this completely vegetarian. 1. Heat a large heavy bottom stock pot (I used a 9qt Le Creuset Dutch oven) over medium heat and add the olive oil. Saute the onions, garlic and carrots until softened. 2. Add the mushrooms and sauté until they release their juices and it begins to evaporate, stirring often. 3. Add the sherry, stir and allow to evaporate slightly. 4. Add the tomatoes, soy sauce, thyme, reserved liquid from the porcinis, stock and barley. Season with salt and pepper and combine. Bring it to a boil and reduce the heat to a low simmer. Allow to cook covered for about an hour (or even more is great), stirring occasionally. 5. Taste and reseason as necessary. 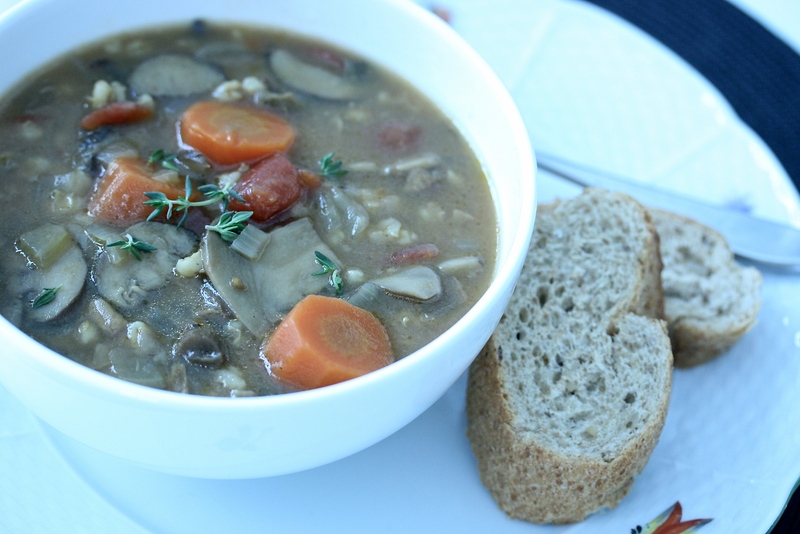 Once the barley is tender, the soup is done. Place the dried mushrooms in a small bowl. Pour 1 cup of warm tap water over the mushrooms, press them into the water so they are submerged and allow to sit for 20 minutes or until the mushrooms feel soft. Set a small strainer lined in cheese cloth over a second bowl, and pour the mushrooms through the strainer. Using your hands, gently squeeze any additional liquid in the mushrooms over the strainer. Set the liquid to the side. I rinse the mushrooms at this point to make sure any leftover grit is gone. Shake out any excess water and chop the mushrooms. Set the chopped mushrooms and the reserved liquid aside until your ready to use them. Be careful to pour the reserved liquid into the soup pot slowly, making sure anything that has settled in the bottom of the bowl stays there. Can it be made without the mushrooms? and would something be substituted for them? Hi. If you eat beef or chicken you could make it with either meat (I like beef for this) and omit the mushrooms (just brown the meat, remove from the pot, saute the veggies, add liquids & barley and put meat back in, simmer until done). I’d also add more veggies. Spinach or kale would be good and butternut squash. Or just up the amount of tomato and carrots. Hope that helps. Enjoy! Looks and sounds delicious! I’ll have to try it out! Thanks! I hope you love it too.